Date Nut Bread (i.e. first post-Max post!) – Voila! This is my first blog post since having a baby! At this point, Max sleeps a lot so that gives me some time to work on a few other, minimal commitment, side projects like this blog. Other side projects include reading and big sky idea brainstorming. (Also napping. Does that count as a side project?) My mom laughed when I told her I had these ideas and wondered how I have the extra time. It might be because James is still on paternity leave so I can write a blog post while he watches Max or because I am trying to do too much and there is in fact no extra time, I’m just squishing a lot in! Each day and night has been so different since we brought him home that I expect in a month Max will have gotten that much bigger and needing more attention, so who knows what the future of my minimal commitment side projects will be. There’s that cliche to live every day like it’s your last. I’m going to write these blog posts as if each one is my last. All that to say, at this point in time, I was able to make this loaf while Max was sleeping. It cooked for an hour so as soon as I put it in the oven I laid down and when I woke up, the house smelled great and I was ready for a snack. Preheat the oven to 350. Grease a loaf pan and line with parchment paper. Combine the dates and brandy-orange juice mixture in a small bowl and set aside while you prepare the rest of the dough. Stir occasionally. In a large bowl, beat the butter and brown sugar together on medium speed for one minute using an electric mixer. Scrape down the bowl. With the mixer on low, add the egg, vanilla, and orange zest. Sift together the flour, baking powder, baking soda, cinnamon, nutmeg, cloves, and salt. Using a rubber spatula, add the flour mixture alternately with the orange juice to the creamed mixture until combined. Stir in the dates with their liquid, and the nuts. Pour the batter into the prepared loaf pan and smooth the top. Bake for 50 minutes, until a toothpick comes out clean. Cool in the pan for 10 minutes, then turn out onto a wire rack and cool completely. 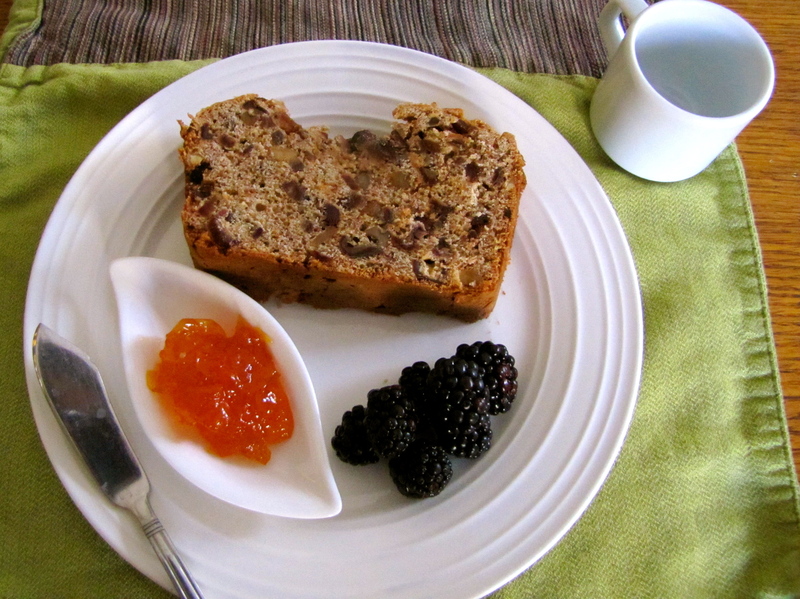 This date nut bread is truly delicious! (but the most special part wasI got to taste it while holding Max! Pingback: Lentil Goat Cheese Bruschetta Dip | Voila!